Our Roz workshop on 14 September was heaps of fun. 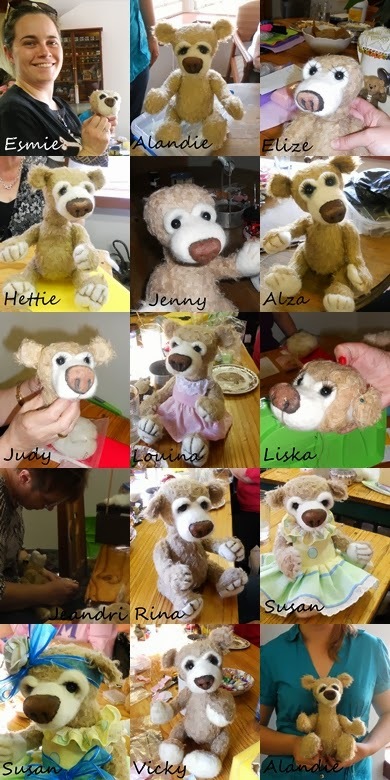 In no small part due to the talented and enthusiastic ladies who came to make bears with us. Sometimes things were upside down. At times we had our feet up. And got our ears pinned back. The end result was a bevy of beautiful bears. Time to go home, Roz. We had fun today! They are all so adorable. How is Dino? Thanks Joyce, yep, the ladies here are talented. Dino is fine, still a bit skinny, but I'm sure he will be back on form soon, feeding him lots. And het still got cookies in the mail this week, his fan club is bigger than mine! Looks like a good time was had by all, and some beautiful Roz Bears went home.